How do we measure a good leader? This must have been debated at every level of the service at length. I have been party to some interesting conversation on garage forecourts at 4am around who has been promoted and who hasn’t, as many cops probably have. Everyone has an opinion, but the consensus often falls onto a ‘good/bad’ footing at some point. The promotion system is often discussed in a very derogatory way by officers at the sharp end. Many have little faith in it and will almost always state that it is one of the reasons they will never try for a leadership position. So what do good and bad look like? What does a competent leader look like? Well this is a tough question and one that is very open to subjectivity. There are some really contemporary thoughts on this in current literature, looking at concepts like ‘Stewardship’ and ‘Followership,’ with older theories espousing various forms of Heroic Leadership and grip/control. Theory aside, many will state, ‘I know a leader when I see one,’ and perhaps this is the best way to define it, as a good leader is often defined by how those they are leading see them. This -of course- means that there will be many different kinds of leaders in many different walks of life. The below is a very quick image from Kotter (who is a pretty well known guy in mgmt theory). It may not be a surprise to think that most of the supervision that cops experience fall on the Mgmt side. There are other graphics that exchange the words ‘Mgmt.’ for ‘Boss.’ Either way, if you think that the biggest influence on Police Leadership has been New Public ‘Management‘ for the last 15-20 years, it stands to reason that Mgmt. as a leadership style has won out. This does not mean that there are not charismatic managers and managers that inspire and support their staff. I know of several who do and are excellent from an anecdotal perspective. It does however indicate that a strong weighting may be present due to the 30 year police employment tenure. 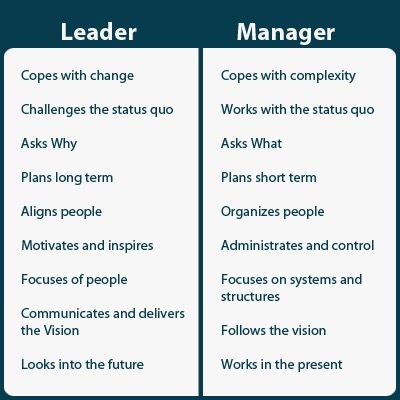 If all you have known is Mgmt., and all the bosses want from prospective leaders is to display ‘strong’ Mgmt., then all you will end up with is more managers. This presents an interesting conundrum, and one that I discussed in my last blog around a reactive policing style favouring a command style of leadership. Does a heavy Mgmt. structure favour only managers? What if you are a great leader? You certainly represent more risk than usual. This can be referred to as Prototype Leadership, or a situation within an organisation where those higher in the hierarchy will select those that they feel most affinity with. In short, bosses will promote bosses who look and act like them. This ensures safety, consistency of delivery, and absolutely no rocking of the proverbial boat. It is by no means particular to policing and happens in many careers on a regular basis. I don’t want to drag this part of the conversation out, but research of candidates during promotion processes showed that those candidates who displayed creativity in problem solving were AUTOMATICALLY thought of by selectors as having less leadership potential. What is happening here? The selectors are selecting ‘safe.’ What are the long term implications of this? Well, unless this particular unconscious bias is addressed, creativity is filtered out of candidates or the creative candidates are filtered out themselves. How do we address this problem? It’s unconscious, it results in stability, it’s consistent for the public… Should we change it? Is it a bad thing for a public service? The answer again lies in diversity. The same research as discussed above, showed that activating the ‘Creative Leader’ prototype addressed the problem. This basically means saying, ‘Hey, selector people, creative candidates can make really good leaders, can we have some of them too?’ This means that the current Leaders asking for creative candidates from selectors may actually result in a large shift in the kind of leaders selected. Putting people in the boardroom who aren’t always ‘safe’ is a good way to grow, not just in the organisation, but personally too. Difference in our leader profiles is therefore necessary for healthy challenge and change. All that is left then, is to organise/develop a system of selection that allows flexibility, where individuals are selected for role, and not for rank. This in turn, may make that pole a little – just a little – less greasy. That however, is a whole new blog. Sounds familiar? It should. You will have seen NPM in the benefits sector, healthcare, policing, education… the list goes on. Do you ever wonder why departments don’t speak to each other within the public services? It is because they haven’t been designed to… Luckily, things are on-the-up in this area and there are signs of improvement. So, it would stand to reason wouldn’t it, that a lot of the processes that we have are based on small areas of public service, measuring small areas of public service. These processes are often insular; they are focused inwards and work to improve micro areas within the department or to further the purpose of only that department. A particular area of the service becomes a priority. This can happen because of public pressure, a review, a change process, or because someone wants it to become one. So if home burglaries became a priority, what would NPM do about it? Well, the first thing that would usually happen is a target would be introduced. This target would be put in place to bring about ‘efficiency,’ drive activity, and allow staff to aspire towards achievement in the workplace, or that is how it would be sold. The next thing would be introduction of tight processes, with a catalogue of checks and balances. This will mean rigorous monitoring of data, and lots of compliance. Skip a step in the process and you will likely be spoken to at the very least, make a mistake by missing a step and usually – over time – there would be issues around discipline. This means that error/anomaly/difference will be ironed out and staff will maintain ‘high’ levels of investigatory standards at all times. Managers think that they are doing the right thing by observing their silos, gateway checks, and process, and believe that efficiency comes as a result of it. Except it doesn’t work like that. Why? Because burglars do not just burgle houses. Burglaries are all different. Cops are not robots. And somewhere amidst all this, is the victim. Following steps 1-10 will not produce a high quality of investigation. A well trained Police Officer with good training and empathy will provide a high quality of investigation. Will all those steps be appropriate for every investigation? Obviously not. But will cops have to do them anyway to maintain ‘quality?’ Absolutely. What does this produce? Well it produces waste, and lots of it. It produces waste for the victim, waste for the cop, and lots of waste for the organisation. From a narrative perspective, what story does it tell the people involved in the process? Cop: You are not capable of conducting a high quality investigation yourself, we have to tell you how to do it, and if you screw up we will be having words. Followers of the process know their job is done when the steps are complete. Numbers and ticks are VERY important, but my individual skill/opinion is not. Organisation: We highly value the correct administration and compliance of our investigations because we believe that if you follow this process, it will assist us to hit our targets. Targets are good because hitting them means we are providing a better service for our victims. There is an emphasis on conformance, and there is a belief that this brings performance. Supervision: Your Police Officers are good if they can follow process and administrate properly. They are great with their victims as I know they contact them when the process tells them to. The charts say performance is improving so my staff must be doing a good job. Although simplified, there are so many problems discussed in these last four points that I can’t do justice to them all. Putting people in process related boxes does nothing for bespoke policing and it dumbs down the officer’s creativity and autonomy. It manages people through numbers and tick boxes, and as we all know, people are not – and never have been – numbers or tick boxes. Now this discussion is missing one very large point. The processes and targets were brought in because overall, the efficiency of the police and other public services was very poor. They were seen as expensive dinosaurs in desperate need of an overhaul. NPM did just that, and process and practices were brought in that did make the profession tighter, more focussed, and it certainly got people working harder. Now however, is the time to work smarter. The austerity is biting, and resources are becoming scarce. The steps in those processes that represent waste must be cut out from the bottom up and the top down. The only important question here is which steps are waste, and which steps have lots of value? How do we answer that question? You guessed it; research. Which of those steps that we do daily generate waste, and which locate offenders? Let’s stop focussing on those reactive steps that follow a burglary, and instead look at the ones that follow a successful detection. Where did that detection come from? What methods are we using that are catching and convicting offenders? Can we improve and focus these steps? Do a large number of detections happen following House to House enquiries? Do a large number of detections happen through CCTV enquiries? Are fingerprints bringing about successful convictions? Where were they found and who lifted them? Is entry and exit route research a contributing factor to conviction? And the real big questions, is convicting a burglar really the way forward? Are there better ways of dealing with them? What is a success for the victim, and is it different to what the cops would say was a success? I could hazard guesses at the answers to these questions, but I don’t want to do that as that is how many of the processes were brought into being in the first place. Evaluation of work flow, processes, and ‘successful’ outcomes should happen regularly as a matter of course. This means a solid partnership and connection with academia. Society is changing all the time, and as a result, continual improvement should not be a department that drops in and out of particular areas in the service, it needs to be a pillar of a public service’s operations. So, there you have it, a whistle stop tour through NPM in public services. In a nutshell, let’s look for some meaning in our process. If it isn’t there, don’t do it. Let’s find the meaning with good research and evidence our decisions when we make them with good professional judgement. Lastly, let’s talk about it. It’s no use being a big secret is it? I work in a force where Evidence Based Policing is becoming daily business. I hope to bring a few examples through as case studies in forthcoming blogs; watch this space. This is my opening blog and hopefully one that will set the tone for forthcoming blogs as time progresses. I would like to use this blog site to promote dialogue and debate, hopefully about improving the way that we Police in the UK. I am open to others posting on here, preferably using the theme of improved Policing through partnerships and research. I would personally really like to see more relationships forming between academia and cops on the frontline. Drop me an email or a tweet if you want to get in touch. How many things in your daily routine are there because they always have been? Officer met with a very disgruntled target who bemoans being awoken at this ungodly hour to check if he is in – especially if he is on tagged curfew. No answer at the door, many neighbours/tenants awoken at said ungodly hour. Officer speaks with target at window who tells them to get lost, having just got out of bed in his boxers. Officer actually gets to speak to a target who welcomes them in. Officer gets sight of what he is wearing, what goods he has in his flat, what make of phone is on the coffee table, and gets a closer look at his physical state. Any Response Cop who works on the frontline would have been involved in these target visits, even if it is to cover for those others doing them. Once completed, a record is made on the target profile so Police know if they were in or not, what they were wearing etc. This record is then used to monitor compliance by the bosses, so who has been doing the visits and when have they happened? Why has the profile not been updated etc.? This is ‘daily business,’ a phrase I will grow to discuss over the coming series of blogs. What is ‘daily business’? Well, it is a kind of activity that is completed because we have always done it and probably always will. It ‘feels’ right, as a cop you sometimes feel that you are getting under the target’s skin, possibly affecting their behaviour. So, how do we buck this trend? How do we move on from the ‘daily business’ of target checks, into something more meaningful? The key lies in research. Now there is an automatic assumption that those that do not work within Policing, are not qualified to comment upon it. I witness this daily on Twitter and not only is it defensive, it borders on aggressive. In the current political climate, protectionism is fairly natural, but there is a standard of behaviour on the street that Police aspire to, and that standard should be consistent no matter the environment. There are already strong partnerships in some areas of the UK, but it is important that the bunker mentality in the Police – completely understandable after all the recent changes/cuts – does not affect the use of good research on the frontline. If evidence exists that is contrary to what police ‘feel’ does or doesn’t work, then the correct response is to explore it. If we ignore it, the ramifications on officer time and ultimately public safety, could be serious. Does 3-4 visits a day change their pattern of offending or heighten deterrence? Would the Police be better visiting at a particular time of day? Would it be better to allow our targets to go about their daily business but record sightings and associations? What happens to the information that we currently record? Is there any value? Is it worth the cop’s time when there are so many other competing priorities? Would cop’s time be better spent on hotspot policing? The questions go on and on, but they could be partially answered with a good quality, single study. It could be done by cops or by academics, as long as there is some rigour around the quality of the data and methods. It would give Police some answers as to where the value sits with target visits and what may and what may not work. This would direct activity far better and ensure that tax payer’s money is actually helping to prevent crime or put prisoners behind bars. Just as a representative sample: around 10 hours a day of cop time is spent on targets visits in my current station. That’s an extra cop, for an extra tour of duty, per day, and around 1.5 Police officers per year… Over the size of a force this could mean the equivalent of 20+ more officers per year. Are those officers (or their equivalent time) actually offering value for money by doing something meaningful? The real answer is that we don’t know. We won’t know until the research has been completed. And once it has, those results need looking at with experienced Police eyes with a view to either reinforcing/narrowing current practice, or changing it altogether into something more meaningful. I shall leave you with a couple of things. Here is the YouTube link for the Center of Evidence Based Policing https://www.youtube.com/user/clsMason Some of the videos on here can get a little academic, but the introduction and most of the practitioner lectures are really easy to watch. The inputs on Hotspot Policing show the kind of rigour you can apply to simple principles to prove that they work. As we lose cops and support staff hand over fist, increasing efficacy and adding meaning to their daily duties becomes more and more important. As a frontline cop myself, I like to be trusted, and to know that what I am doing makes a difference. Conducting daily business, simply because it is ‘daily business’ is not enough. I want to know that I am doing something positive, and finding out what works is an integral part of that. Police shouldn’t be afraid of research; they should welcome it, because it often answers questions that may never have been asked. It challenges entrenched thinking and can come to conclusions that just ‘feel’ wrong. Well those feelings have been built up over a long time in the workplace until they form grooves of practice. They continue because it feels normal to follow them. Some of those grooves just may be heading in the wrong direction. With less cops, finding out the right direction has to be important, doesn’t it?